Take a closer look at ASTRA's Best Toys For Kids Nominees in the Constructive Play category. Little builders with big ideas can work right at this professional-looking station. Shelves and storage keep all the tools and supplies in the 38 piece set within easy reach. Includes an "adjustable height counter that grows with a child," Robin Lehnert, Marketing Manager for Hape North America, told TDmonthly. Launch date: January 2012. How can kids move a ball into a target with 2 high walls from 2 feet away? Build a ramp? A catapult? A trampoline? A zip-line? There are no right answers and we provide no solutions--it's up to kids to use ZOOB pieces (and other materials that they choose) to build contraptions that solve the challenges. The ZOOB Challenge features 175 ZOOB pieces, string, wheels, a ball, rubber bands, a foam play pad, and 25 challenges based on STEM (Science, Technology, Engineering, & Math) skills-skills that educators have targeted as essential to helping the US compete successfully in the 21st century. With over 90 different attachments the Nexus offers maximum play value. 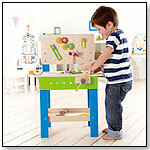 With attachments like wheels, a scoop, hands, feet, wings, springs and more, the possibilities for creations are endless. Build a flying Martian, a hovering robot, or objects that fly, drive, and spin. The Nexus includes 4 flexible OGOBILD balls for hours of fun, and increased variety. 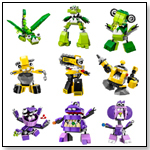 nanoblock musical series assortment by OHIO ART CO. 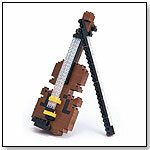 The nanoblock ‘Miniature Collection’ includes a wide range of musical instruments. Form a miniature band with the Drum Set and Electric Guitar or perform a piccolo concerto on the Grand Piano or violin. nanoblocks are all about the creative construction process with rewarding sculptural results – the perfect three-dimensional puzzle. The miniature blocks connect securely to create extremely detailed objects of varying size and complexity. Challenging three-dimensional puzzle with amazingly small sized building blocks. With a simple click, wheels, cockpits, wings and panels attach to the magnetic bars. 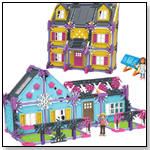 48 magnetic pieces provide building variation and fun that reaches the finish. 18 medium bars, four long bars, two cockpits, four pairs of wheels, ten metal balls, two ramps, two containers, and four panels. Giant, non-swallowable 1.8 inch diameter metal balls.